Essence is one of my favourite makeup brands ever so I'm always excited when I'm sent more of their fantastic products! As summer is here (all at once in the UK) then it's time for some summer festival ready makeup looks using Essence products! I was sent a range of their eyeshadows, liners and long lasting products. I've tried their waterproof mascaras and long lasting lip products already and love them. I recently published a post about the new Essence blogger secrets range which you can check out. This first look uses the following products: *2 in 1 eyeshadow and liner waterproof in the shade 01 Go Bro'nze which is a creamy bronze eyeshadow crayon that can be used as a liner and that is how I used it. I also used the *Long Lasting Eye Pencil in 05 C'est La Vie; it's a luminous silver liner that looks so nice in contrast with the warm toned bronze shade. Lastly, I used the *All Eyes On Me Mascara. This look would be great for a festival as you don't need brushes, the products are long lasting and the look only uses three products! A bit more of a colourful look now, which really isn't like me as I don't do colour but I like this one! I used another *Essence Long Lasting Eye Pencil but I used the shade 12 I Have A Green which is such a pretty, deep emerald green. I applied the liner and smudged it slightly then in a 90's twist, I added a few nail stickers to the corner of my eyes - who knew you could use nail stickers like this...well probably everyone but me until now. For all three looks I created I used Eylure brow products as I don't own any Essence brow products as well as the *All Eyes On Me Mascara in Black. 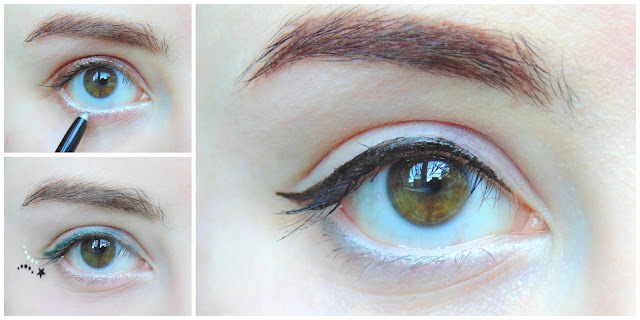 This final look is definitely my favourite as I just love classic black winged liner! I used the *Essence Liquid Ink which is an amazing liquid liner and it doesn't dry out! For some colour I added the *Essence The Velvets Shadow in 09 Bahama-Mama which is a pretty summery pastel blue shade - even though I don't really like colourful makeup, I do love the combination of black winged liner and pastel shadows on the lower lash line. What do you think of my festival looks? Have you tried anything from Essence, if so which products do you love? Labels: beauty, essence, essence makeup looks, festival makeup, makeup looks summer, summer 2016. Categories: beauty, essence, essence makeup looks, festival makeup, makeup looks summer, summer 2016.
loving the bronze liner look! gorgeous shade! I love the wing liner one. It looks gorgeous yet natural on you.